Of late, the global fresh cherries market has been witnessing a steady rise. With the increasing awareness regarding the harmful effect of preservatives, consumers across the world are preferring fresh fruits and vegetables, which is also reflecting on the demand for fresh cherries greatly. The increasing consumption of fresh cherries in emerging economies, fueled by the rise in the purchasing power of consumers, is likely to add significantly to the growth of this market in the near future. The worldwide market for fresh cherries is expected to present an opportunity worth US$3.99 bn by 2017. Further, the market is projected to rise at a robust CAGR of 5.50% during the period from 2017 to 2022 and reach US$5.22 bn by the end of 2022. The rising export demand for fresh cherries is anticipated to boost this market substantially in the years to come. Primarily, the global market for fresh cherries is examined on the basis of the taste, sales channel, and the application. Based on the taste, the market is classified into sweet and sour. Sweet cherries are witnessing a much higher demand than sour cherries. The segment is expected to hold more than 60% of the overall market by 2017 and is expected to remain dominant over the next few years. By the sales channel, the market is categorized into modern trade, traditional grocery stores, convenience stores, online channels, direct sales, and various other retail formats. Traditional grocery stores and convenience stores are the prime sales channels for the trading of fresh cherries and this scenario is expected to remain so over the forthcoming years. Online channels and direct sales are also gaining momentum in this market. 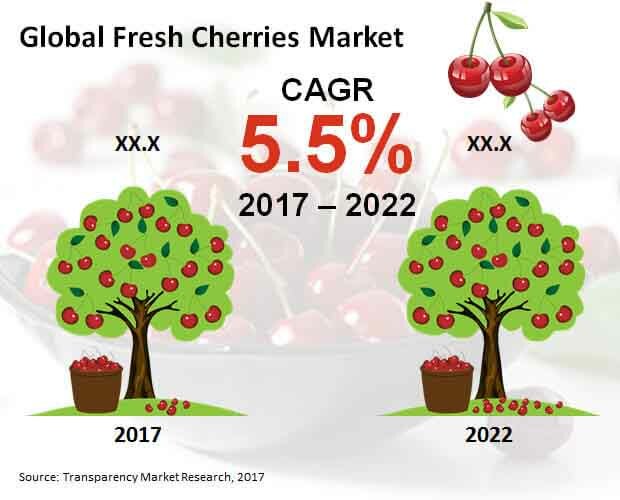 Direct consumption, dairy beverages, ice creams, jellies, salads, and alcoholic beverages have surfaced as the key application areas for fresh cherries across the world. Among these, the consumption of cherries is more into tarts, bakery, jams, and jellies compared to other application areas. The worldwide market for fresh cherries is also classified on the basis of its regional spread. North America, Europe, the Middle East and Africa (MEA), Asia Pacific excluding Japan (APEJ), Japan, and Latin America are considered as the key regional markets for fresh cherries across the world. With the advent of China as a prominent consumer of fresh cherries, Asia Pacific excluding Japan has emerged as the leading regional market for fresh cherries and is anticipated to continue its growth streak at a CAGR of 5.90% during the period from 2017 to 2022. China offers good opportunities for market’s growth due to the rising consumption of cherries, triggered by the continued urbanization and the increasing adoption of western culture. The augmenting disposable incomes of consumers are also projected to contribute to the increased demand for cherries in this country. This, as a result, is anticipated to propel the market for fresh cherries in the APEJ region in the years to come. The markets in Europe and North America will also witness steady growth in the near future, thanks to Turkey and the U.S. emerging as the leading producers of cherries across the world. Leelanau Fruit Co., Rainier Fruit Co., Dell's Marachino Cherries, Vitin Fruits, Alacam Tarim, The Global Green Co. Ltd., Smelterz Orchard Co., Hood River Cherry Co., and BEL'EXPORT NV are some the key vendors of fresh cherries across the world. The world fresh cherries market is prophesized to fare quite well due to growing awareness about the benefits of fresh fruits and harmful effects of preservatives. Consumers worldwide now prefer fresh fruits more than the ones with preservatives. The analysis anticipates that the world market for fresh cherries is to be appropriately divided into taste, sales channel, application and by geography. The category of sweet fresh cherries that comes under the segment of taste is expected to gain impetus and spearhead the market with its growing popularity and increasing application in a variety of products across the globe. The researchers of this report have provided an exhaustive analysis of the world fresh cherries market coupled with considerable focus on the market’s competitive matrix. Each of the regional segments of the market has been studied and evaluated in detail so as to divulge opportunities that had remained undisclosed so far and the prospects of growth that are quite likely to emerge in the years to come. The world fresh cherries market is predicted to gain impetus and experience considerable market growth due to a significant rise in awareness about the health benefits of fresh fruits and growing disposable income of the people. There is an increasing demand for fresh vegetables and fruits for consumption and as such we see increasing demand for fresh cherries as well. Furthermore, with increasing disposable income, people are willing to spend more on fresh cherries. Cherries come with a lot of health benefits and they belong to the family of apricots, plums, almonds and peaches. It is often used in various dessert preparations such as in pies, garnishing in cocktails and so on. Cherries are known to have compounds that are cancer preventive. Furthermore, it also cuts down the risk of gout and helps in the reduction of inflammation. In addition to that, it reduces the risk of stroke and helps in the diminishing arthritis pain. With all these benefits, the market for fresh cherries is forecasted to grow fairly well. Sweet cherries are considered more popular than the sour ones. It is extensively used in ice creams, salads, jellies, alcoholic beverages, and so on. Furthermore, cherries are consumed more into jams, bakery, jellies, tarts and the like. So far as regional dominance is taken into account, China emerges as a prominent consumer of cherries across the globe and is foreseen to remain such a leading consumer over the timeframe of forecast that stretches from 2017 to 2022. Much of the growth of China is due to increasing consumption of cherries in the country. Asia Pacific has been a leading region due to growing popularity of fresh cherries and increasing disposable income of the people of this region who can now afford and are willing to spend on fresh fruits such as cherries for various health benefits. Increasing urbanization and growing adoption of western lifestyle are also estimated to stimulate the demand for cherries in this part of the world. Apart from Asia Pacific, Latin America is also forecasted to offer promising market for fresh cherries owing to its health benefits and increasing adoption of western culture. The report also comes with an assessment of other important regions of the international Fresh cherries market, namely the Middle East and Africa (MEA), Europe, and North America. Some leading Fresh cherries companies which are worth assessing and evaluating are BEL'EXPORT NV, Hood River Cherry Co., Alacam Tarim, The Global Green Co. Ltd., Dell's Marachino Cherries, Leelanau Fruit Co., Rainier Fruit Co., Smelterz Orchard Co., and Vitin Fruits. The analysis shares an exhaustive understanding of the primary characteristics and the nature of the market’s competitive landscape.